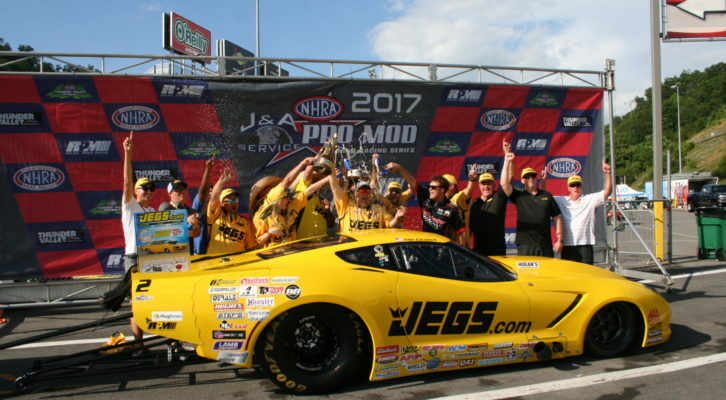 BRISTOL, Tenn. – Troy Coughlin powered to the NHRA J&A Service Pro Mod Drag Racing Series victory Sunday at the NHRA Thunder Valley Nationals at Bristol Dragway. This weekend’s Pro Mod racing, presented by the Real Pro Mod Association, was the seventh of 12 events on the 2017 schedule. 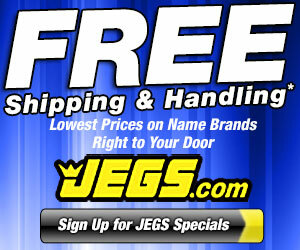 Coughlin ran a 5.878-second pass at 253.09 mph in his JEGS Mail Order ’15 Corvette to defeat No. 1 qualifier Shane Molinari and his S&T Truck Repair Inc. ’68 Firebird’s 5.881 at 254.76 for his first win of the season. It was Coughlin’s second consecutive final round appearance and 10th career win. He is currently second in points while Mike Castellan maintains the points lead after a quarterfinal finish. 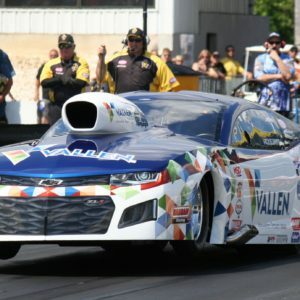 NHRA J&A Service Pro Mod Drag Racing visits Norwalk, Ohio for the Summit Racing Equipment NHRA Nationals at Summit Racing Equipment Motorsports Park June 22-25. Final finish order (1-16) at the 17th annual NHRA Thunder Valley Nationals at Bristol Dragway. 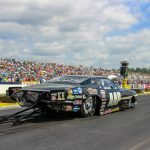 The seventh of 12 events in the NHRA Pro Mod Drag Racing Series. 1. Troy Coughlin; 2. Shane Molinari; 3. Rickie Smith; 4. Jonathan Gray; 5. Bob Rahaim; 6. Mike Castellana; 7. Sidnei Frigo; 8. Michael Bowman; 9. Michael Biehle; 10. Steve Jackson; 11. Steven Whiteley; 12. Steve Matusek; 13. Pete Farber; 14. Khalid alBalooshi; 15. Mike Janis; 16. Jim Whiteley. 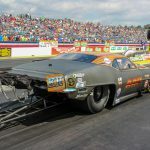 Final round-by-round results from the 17th annual NHRA Thunder Valley Nationals at Bristol Dragway, the seventh of 12 events in the NHRA Pro Mod Drag Racing Series. FINAL — Coughlin, 5.878, 253.09 def. Molinari, 5.881, 254.76.